I walked into the heart of a friend, and found a home. 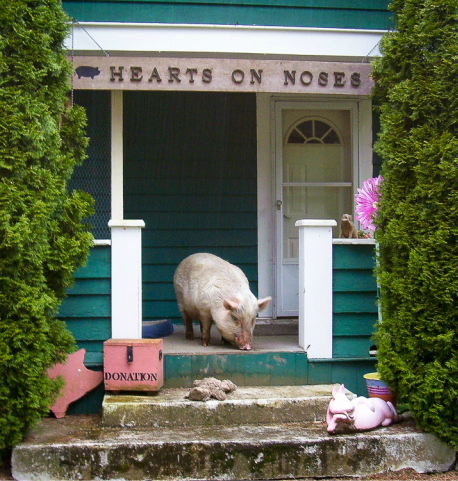 ﻿Located in Mission, BC, Hearts on Noses (HONs) was established in 1999 as a sanctuary for potbellied pigs. "Mini pigs" were a popular pet in the 1980s, and continue to be bred and sold as companion animals today. However, many purchasers are ill prepared or misinformed about the adult size, behaviors, and needs of potbellied pigs, and fail to carry through with a lifetime commitment. In other cases, these pigs fall into the hands of abusers where they suffer cruelty and neglect. The sanctuary, inspired by Willy, now provides a home to more than 40 pigs (including potbellied pigs and full size pigs who were destined to become food). We also have a few non-pig residents. The sanctuary is a place where these animals have found refuge from the harsh world that sees them as little more than pieces of property. Unlike so many others, they will receive love and care for the rest of their lives. At Hearts on Noses, all animals are equal and deserving of love and respect. Please support the work that we do to rescue animals and provide them with the best care. You can also make a huge difference for animals by refusing to support their exploitation - learn about living a vegan lifestyle to save countless unseen animals from lives of misery.